Gary P. Miller, a North Dakota native, is best known for his representations of rural America, especially scenes from North Dakota and Arizona. He studied art in high school and college but is mostly self taught. His work was recognized nationally. In 1982, the Old West Trail Foundation presented Gary with the "William F. Cody Award" for portraying rural America in his paintings. In 2003, the State of North Dakota Certificate for Lifetime Achievement Award was given to Gary in recognition of his outstanding contributions in the visual arts. 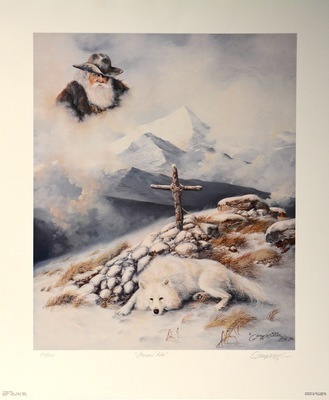 The mountain man's final home, brushed by clouds and mountain winds, is kept warm by the love of his best friend, "Buddy". It's all he would have asked for. "Forever Pals" is Gary P. Miller's sequel to his ever popular "Mountain Pals" series.